On returning every day across one week of a major Tesco-Lotus store, not once was the lane open to serve the budding conservationists with multi-use bag in hand. Not a very committed start to entice the plastic people to change a habit of a lifetime. You either do it and prioritise it… or not at all. One can’t help but feel it’s all a bit of a publicity stunt, without the essential commitment to change both in-store procedures and customer habits. Of course the obvious route, and the only one that has worked internationally, is to introduce a small fee for each plastic bag, the profits of which go directly back into local conservation causes. But most importantly, this raises the issue across every lane and counter, whether fast or sloth-like. It is brought to the attention of every consumer that you must pay for your need in purchasing a plastic bag or pay a little bit more for a multi-use bag. Better still, bring your own grocery bags with you as a force of habit. How it has worked in other countries is simple: Shame. Shame creates change a lot faster than a call for conscientious behaviour change. But of course this is a step too far in the boardroom of the Goliath retailer. Who’d take on a nation of waste junkies in the war to get them in store? But there should be a different type of shame on the face of the international companies, such as Tesco, who have introduced exactly these systems and processes in other countries. Tesco is the third largest retailer in the world on its gross revenue, so let’s just assume it might just have the means, if not the inclination. 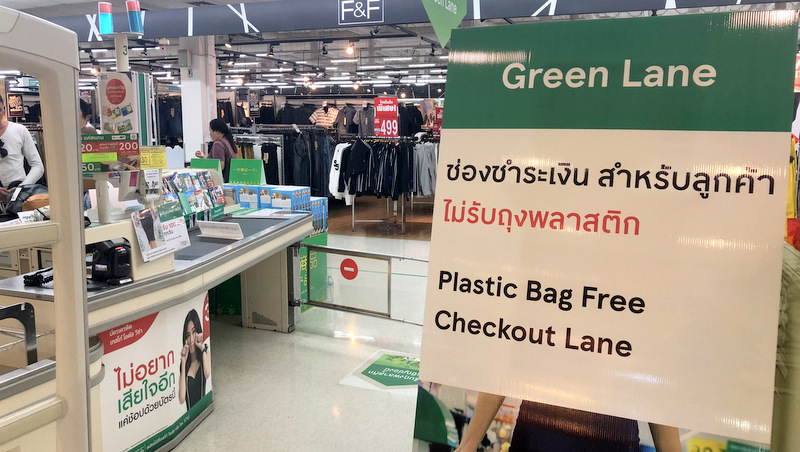 Surely, of them all, THEY should be the ones leading the way and enforcing the knowledge on practical steps to reduce our waste and impose, as well as promote environmentally friendly practices that would educate and force Thai companies to follow? One fears they are playing dumb to the issue and simply paying lip service to quieten the lobbyists. Of course it's just a publicity stunt. It's done to get the "budding conservationists" into their shop and spend money. Fortunately for Tesco-Lotus, there are plenty of such "budding conservationists" - also called tourists - who think they are going to save the planet, or some such nonsense.